Okay, this book starts out with a warning from Rothfuss about how you, the reader, shouldn't buy this book. In as much as I had already bought the book, the warning was a bit too late. Amusingly enough, the last part of the book continues this trend, with an explanation of how the book came to be, and came to be published. I enjoyed the book, even if I know that Andy hated the book. It's about Auri, and the perceived workings of an off-drummer, but-I'm-sane-from-my-perspective mind. It has nothing to do with Kvothe, which puts it in a weird place. I wouldn't recommend the book. The illustrations, however, are delightful, and could make really nice woodblock or letterpress prints. "It is the patient, cut-flower sound of a man who is waiting to die." 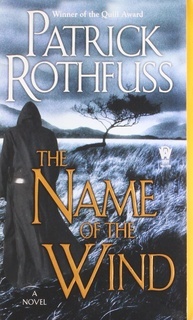 Okay, book two of the Kingkiller Chronicle, Rothfuss continues along right where The Name of The Wind left off. Like, I finished one book and picked up the next and boom, I was back in the same world. And wow, was I happy to be back. All the characters I expected were back, a few were added, and dammit, I now have to wait for book three to come out sometime in the next... never. Of the book, well, the last 80 pages or so are the denouement, which was somewhat amusing to me, to have so much of the story as a wrap-it-up-already part of the tale. I kept thinking, what, why. There were a couple of twists that I did not see coming, which is great. For the most part, I enjoyed the book highly, wish I had taken more notes, and will recommend the (yes, still unfinished) series. Wait, I do have something to complain about. When Kvothe tells the Chronicler in the first book his story will take three days to tell, he was living on a planet with 58 hour days. How do I know this? Because the audiobook is 43 hours long. It tells of Kvothe's second day of telling, glossing over some of the auxiliary events and interactions of the day. If the telling took 43 hours, that wasn't a single-day telling. 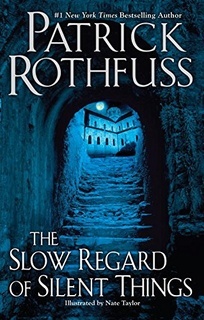 Rothfuss wrote a Jordan-worthy saga, and let us all have it for cheap. I have had this book on my shelf for a long time. I knew this was the first book of the series and that the series wasn't completely written and that the fans of the author are as frustrated with the author's not completing the series as much as George R.R. Martin's fans are at not finishing the Song of Ice and Fire already. So, I hadn't started the series, of which there are two books currently published. Well, earlier this month, for reasons I don't quite recall, I picked up the book and started reading. And immediately kicked myself for not having started reading the book when it was published, almost ten f'ing years ago. The story is told in two timelines: present with Kote the innkeeper, and Kvothe, a young kid of eight as he grows up and into Kote. The first part of the book, described to me as "the slow start of the book, just get through it to the good stuff," was interesting. And I like how the present and past interweave. 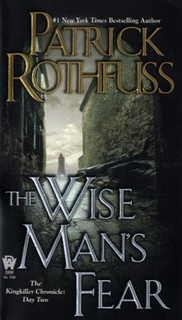 I like Rothfuss' story telling, and I like the world he has created. Recommended if you like sci-fi fantasy books. Along with the next book, The Wise Man's Fear, which I started reading about 5 minutes after I finished this one. That one is going to mean I've read only 73 books this year, since it'll likely take me until the end of the year to finish it. And then I'll be among the many, many fans wondering when book three will be out.